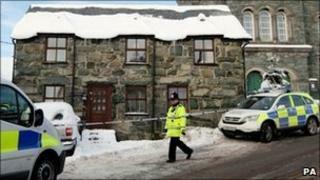 A mother and her two young children found dead at a house in Gwynedd, have been officially identified. Melanie Stevens, 36, Philip James Andrew Stevens, five, and Isaac David Stevens, two, were found at their cottage in Trawsfynydd on Sunday night. Police broke in after reports from concerned relatives. Commenting on a newpaper report, police said there was "nothing to suggest" Ms Stevens had been a target of anti-English racism. Neighbours and people in the village said the family moved to Trawsfynydd about 18 months ago from the Midlands. "There is no anti-English slant to the investigation," said a North Wales Police spokeswoman. A newspaper had quoted an unnamed neighbour as saying Ms Stevens had an English voice and claiming she had "a lot of hassle". The three were formally identified by the Coroner for North West Wales, Dewi Pritchard Jones. Police are expecting to hold a briefing later on their inquiries. Ms Stevens was a mother-of-five. Her three older children are thought to live with their father. Philip, known as Pip, attended primary school at Ysgol Edmwnd Prys. Head teacher Gwenan Williams of Ysgol Edmwnd Prys, Gellilydan said: "Philip was a very happy, popular boy who had made many friends at Ysgol Edmwnd Prys. "One of his favourite activities was role play, and he had a very lively imagination. "He had learnt to speak Welsh confidently, and always had a smile and time to chat with everyone." People n the village, which has about 700 residents, said the family seemed "happy and pleasant". It is believed Ms Stevens was originally from Blaenau Ffestiniog, a few miles away.